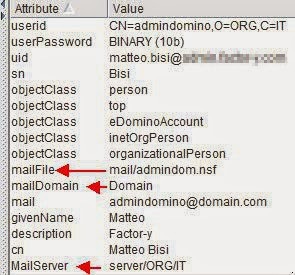 If you need to setup the IMAP(s) access through LDAP you have to insert some additional fields in LDAP containing some key info like mailFile, MailServer and mailDomain. This kind of config has worked properly until the first Fixpack of Domino 9.0.1 . When i've started to install FP1, FP2 or FP3 the IMAP user authentication was stopping work but the authentication was still working properly thorugh a Browser! It finally works ! Thanks Graham for the Help ! IBM has also created this technote when this issue is explained as APAR LO84195 . If you are finding the same issue, contact IBM Support to obtain the appropriate fix for your environment.